Keep chickens cool, Depending on where you live and your climate, it can be difficult to raise chickens in the summer. Imagine living in the dry southwest or the humid southeast. Can you still safely raise chickens in the heat? Here’s how to keep chickens cool in the summer. Here are top tips for keeping chickens in the blazing summer heat. Keep in mind the UV rays, especially at higher altitudes. The thermometer is not always an accurate measure of the heat index, especially with the direct sun. Here are best tips for keeping chickens cool and safe. Plenty of clean, cool water is essential. Even if you have a water pump system, put out extra water for them in several easy-to-access shallow bowls. Put in several ice cubes as well. Keep the water bowls in the shade. Chop strawberries, pineapple and bananas into small pieces and freeze them for a few hours. You can try blueberries and cucumber as well. Save your kids’ watermelon rinds. Chill the rinds in the refrigerator, and then give them to your chickens for a cool treat. Your chickens will love it. They will need shade, even something temporary, as their coop alone is not sufficient. Supply them with shade in a well-ventilated area, even if it’s makeshift. You can purchase a shade tent, a shade sail, or rig something with tarps or sheets. Consider a window that’s safe from predators and a fan. Depending on long the hot season is, it may be worth it to consider installing a misting system, even for a small area. If you want something less expensive and less permanent, buy a misting attachment for your hose and prop it up for cool relief. Bacteria multiples faster in the heat. Keep your chickens clean, cool and comfortable. Keep a small pool in the shade. Fill it up with just an inch or two of water so the chickens stay safe. Add ice cubes throughout the day. The chickens will enjoy being able to come and go as they please. Check on the chickens at least twice a day during extreme temperatures. Be sure to watch for signs of heat exhaustion and heat stress in chickens. From the start, work to house your chickens in an open air system with an attached run. You can provide ventilation and ongoing shade which are more important than an enclosure which provides warmth. It is easy to raise chickens when you set things up correctly and properly from the start. Here’s what to know about raising chickens. Be mindful of your neighbors. They probably don’t want to see, hear or smell them either. Decide how many eggs you want per day. That will determine how many hens to buy. You need to plan for one chicken per three square feet at a minimum. 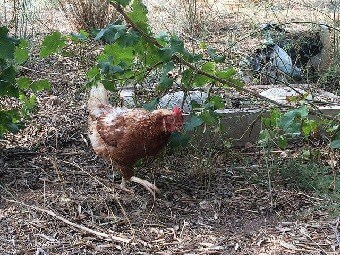 Find out what predators live in your area, especially if you have a fenced in area for the chickens (Fence Installation Hacks for Putting Up Fencing). Consider getting a livestock guardian animal. Install a long PVC pipe and connect it inside the coop to their trough so you can fill their feed from the outside. Cap it so you don’t attract critters. Install a water pump system so you won’t have to always refill their water. The chickens peck it to turn it access water. Fencing is key. Use a wire tighter than chicken wire such as hardware cloth. Depending on your predators, make sure the wire is at least 10″ underground as well. Raccoons are a huge threat to chickens and can reach in with their paws to kill chickens through chicken wire. Raccoons and other animals can dig down deep so be sure to put the fencing deep enough. Consider a treadle feeder in order to keep rodents and wild birds from feeding on the chicken feed. If they won’t be free range, the general rule of thumb is 3 – 4 square feet of coop space per hen and 10 feet of run space per hen. Having enough space will help prevent the chickens from fighting. Before you get chickens, it is a great idea to take care of someone else’s chickens for a few weeks. They are easy but do take time and attention. 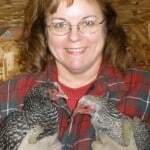 Growing up in the suburbs of Chicago, I’ve never known anyone to own chickens. But after moving to the Las Vegas area, it seemed commonplace. Raising chickens can be fun but you must keep them safe. We wanted to raise chickens but knew how to keep chickens cool in the summer heat was a concern. These tips have kept our chickens safe and comfortable.